U.S. congresswoman will join UCF’s Board of Trustees chairman emeritus and university president in addressing more than 5,700 graduates. UCF has announced its speakers for the Fall 2018 commencement ceremonies. U.S. Rep. Stephanie Murphy will join UCF Board of Trustees Chairman Emeritus Michael J. Grindstaff and President Dale Whittaker in addressing graduates during four separate ceremonies Dec. 14-15 at the CFE Arena. 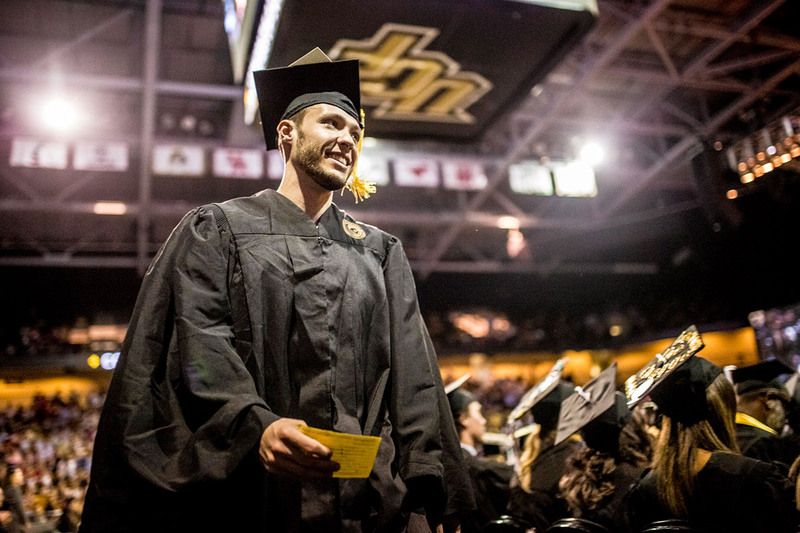 More than 5,700 degrees will be conferred during UCF’s annual fall commencement ceremonies. Nearly half of the degrees will be awarded to students from traditionally underrepresented communities, with Hispanic and Latinx students comprising more than one quarter of all degree recipients. UCF has awarded more than 329,000 degrees since classes began 50 years ago in the fall of 1968. Dec. 14 at 9 a.m. – Commencement ceremony for the College of Business, College of Engineering & Computer Science, and College of Optics & Photonics. Since 2017, Murphy has represented Florida’s 7th Congressional District, which includes Seminole County and much of northern Orange County. She is a former businesswoman, college instructor and a national security specialist in the Office of the Secretary of Defense. While with the Office of the Secretary of Defense, Murphy worked on a wide range of national issues — such as counter-terrorism, foreign military relations and strategic planning — and earned numerous honors, including the Secretary of Defense Medal for Exceptional Civilian Service. In the private sector, she served as a strategy consultant at Deloitte Consulting. Murphy is an alumna of Georgetown University and the College of William & Mary. Dec. 14 at 2:30 p.m. – Commencement ceremony for the College of Graduate Studies and College of Sciences. In addition to his role on UCF’s Board of Trustees, Grindstaff previously served as chairman of the UCF Foundation, director of the UCF Athletics Association, and president of the UCF Golden Knights Club. He is a member of the UCF President’s Trust Society, the UCF President’s Medallion Society, past director and lifetime member of the UCF Alumni organization, and a UCF Alumni trustee. A partner in the law firm Shutts & Bowen, Grindstaff’s legal practice has been concentrated in the areas of real estate transactions, land use and development. He earned a finance degree from UCF and a J.D. from the Walter F. George School of Law at Mercer University. Dec. 15 at 9 a.m. – Commencement ceremony for the College of Community Innovation & Education and College of Health Professions & Sciences. Dec, 15 at 2:30 p.m. – Commencement ceremony for the College of Arts & Humanities, College of Medicine, College of Nursing, College of Undergraduate Studies, and Rosen College of Hospitality Management. Whittaker became UCF’s fifth president in July. As president, he focuses on continuing UCF’s remarkable trajectory in academics, athletics, research and community impact while striving to expand opportunity and access to education. Whittaker came to UCF in August 2014 to serve as provost and vice president for Academic Affairs, providing leadership to UCF’s 13 colleges, multiple campuses and research centers and institutes. As a professor, he specializes in agricultural and biological engineering, with an equal passion for the arts and providing students with authentic learning experiences. Before coming to UCF, Whittaker served in multiple faculty and leadership positions at Purdue and Texas A&M universities; he also is an alumnus of both universities. Tickets are required for ceremony admission. Graduation announcements cannot be used for admission. Graduate candidates will receive tickets with their cap and gown order; each graduate candidate will receive up to five guest tickets. Information on ticketing is available online at commencement.ucf.edu/2018/fall/tickets. Guests who do not have tickets are able to watch the ceremony in the UCF FAIRWINDS Alumni Center and the Student Union. Tickets are not required for the telecast, which is closed captioned. The Alumni Center will open at 8 a.m. on both Dec. 14 and 15. The Student Union will open at 7 a.m. Dec. 14 and 9 a.m. Dec. 15.